I've bought a few nail varnishes from Models Own's various collections but in general most of them haven't really appealed to me. There hasn't been anything wrong with any of them, they just haven't really been to my taste. The Velvet Goth range was one that really didn't appeal to me as I didn't like the effect it provided and knew I wouldn't be able to use the velvet covered lids *shudders*. When I saw the first promo images of the new Chrome collection it really caught my attention with its very pretty bottles. 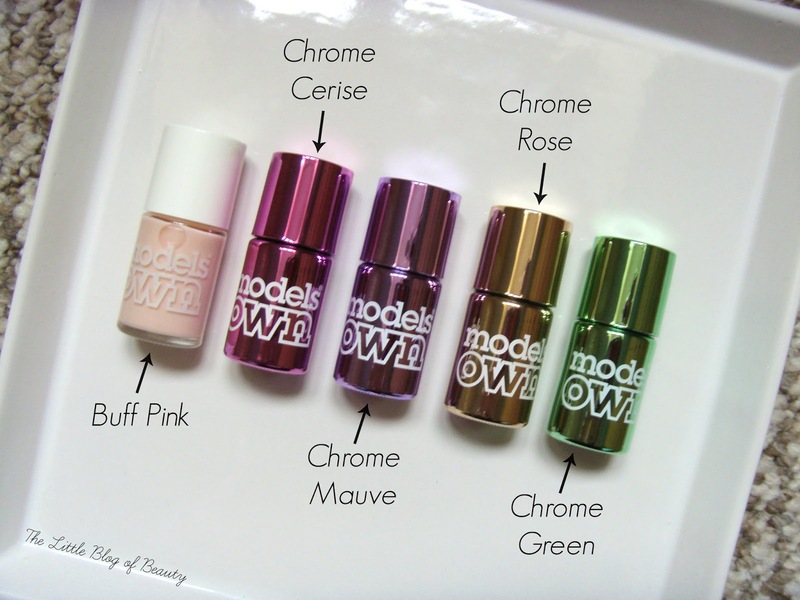 When Models Own launched their half price sale in January they included a limited number of the new Chrome varnishes before they had officially been released. I ummed and ahhed for a while before deciding to see if any of the Chrome varnishes were left a few days after the sale launched and as there were I decided to try some. As you can see I didn't just order some of the Chrome varnishes I also added Buff Pink from the standard range to my order. I wanted a new barely there pink shade, the sort you would use for a French manicure, as my existing ones were past their best. 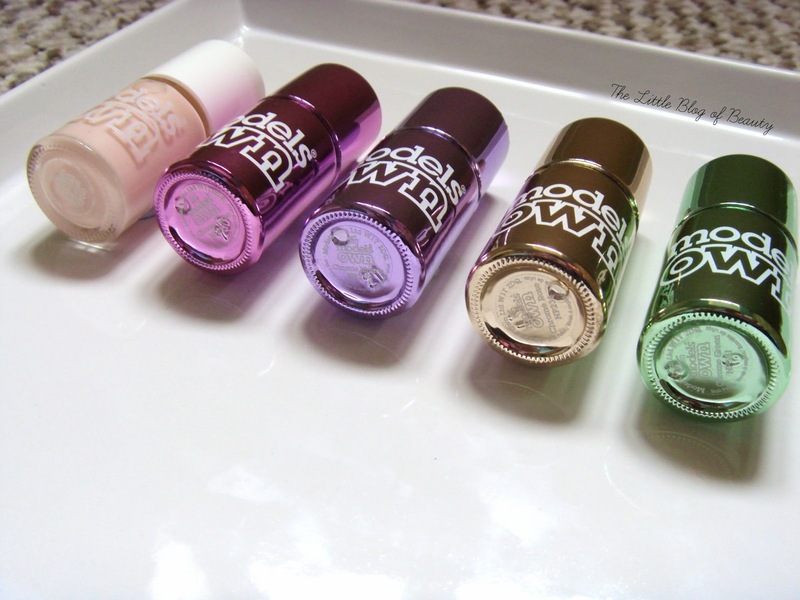 I had a hard time trying to decide which Chrome shades I wanted to try but ended up settling on Chrome Cerise, Chrome Mauve, Chrome Rose and Chrome Green. As you might be aware chrome nail varnishes are notoriously difficult to apply because you usually end up with very obvious brush strokes in the finish, but I actually didn't find these too bad at all. If you look closely yes you can see some brush strokes, but from a distance they're really not too bad. Models Own suggest not using a base coat or a top with these and although I didn't try them with a base coat I would agree with avoiding a top coat. The photo above is without a top coat and when I did add one to see what happened it appeared to emphasise any brush strokes or faults in the nail. Models Own also suggest buffing your nails before application to try and get rid of any ridges or imperfections but if you have nails like me you won't be able to get rid of them all. You can see my ridges and the strange 'dents' I get in my nails but I don't think it looks bad. I thought I would prefer the lighter shades, but then ended up ordering three of the brighter shades (go figure!) and actually I really like Cerise and Mauve. Rose was the shade I most wanted to try but I'm actually slightly disappointed with it. Only because I think I was expecting it to be slightly more pink, but it's still a lovely colour. I'm really pleased I did decide to buy a few. I like the chrome look and I'm happy with my colour choices. You can get these from the Models Own website and Models Own bottle shops. You can also get them in Superdrug but I'm not sure if Models Own is still available in Boots as the display has been removed from my local store and they're no longer available online. Have you tried any of the new Chrome nail varnishes? These look great next to each other. I really love the designs of the bottles, I bet it makes them easy to find too! These polishes are gorgeous! I absolutely love your blog design!